There’s no place quite like home, is there? As you age, it’s natural to want to do so in your own space, surrounded by the memories you’ve made, the belongings you’ve collected, and the people you love… even when that means remodeling your space to suit your changing needs. From do-it-yourself upgrades to professional-level projects, we’re here to help you make your home a safe, comfortable space to grow old independently. Aging in place doesn’t just happen. In order to ensure you, your family members, and your home are ready for your changing needs requires planning. And planning starts with an honest evaluation of your situation, including your housing options, health and wellness, finances, transportation, community involvement, social interaction, and overall quality of life. 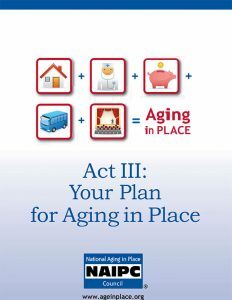 A printable PDF planning tool from the National Aging in Place Council that helps you assess your needs and identify next steps to aging in place. 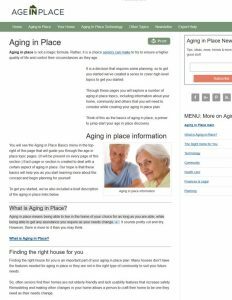 AgeInPlace.com gives you an overview of what aging in place is and how to get started. 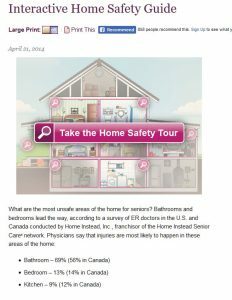 This online activity from CaregiverStress.com will take you room by room, showcasing common hazards you need to look out for in your own home. 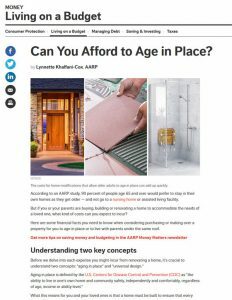 From zero-step entrances to arthritis-friendly door handles, this AARP.org article will give you the average costs for some of the most common aging-in-place home modifications. The thought of upgrading your home’s accessibility can be daunting. All those repairs and projects take time and money. Luckily, there are a few simple, inexpensive projects just about anyone can do themselves (with the help of a few friends or family members) to make any home safer and allow you more independence. Some remodeling projects will require the help of professionals. While these projects will take more time and cost more money than DIY upgrades, they are essential to ensuring you are able to remain in your home as you age.